DC-50 is a portable LCD monitor for use with an interchangeable Lens Digital Camera or an interchangeable Lens Digital HD Video Camera Recorder with an HDMI terminal and live view mode.It can display HDMI video output from the camera. 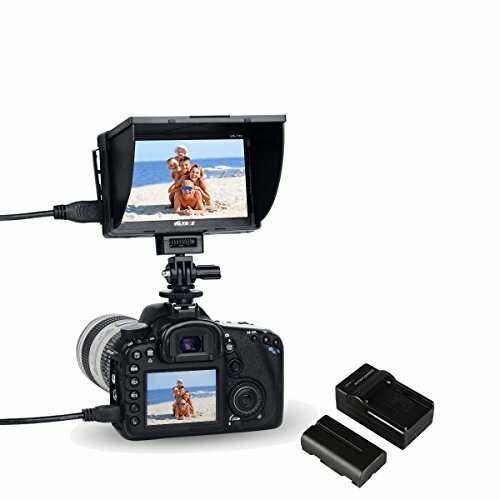 Clip-on LCD Monitor adopts with 5-inch TFT high resolution LCD panel, is loaded with pro-style features to help photo enthusiasts and video-graphers shoot high-quality HD video footage with their Interchangeable Lens Digital camera. very light weight even with the battery. Several HDMI, AV ports, Wide viewing angle LCD screen. Adopting advanced TFT HD screen, low power consumption, and stable performance. It can show the exposure and area accurately. It can used for HDMI port, AV port and Live View. Powered by two power supply , rechargeable batteries or AC outlet with AC/DC adapter. It can show the HDMI video signal from camera. It's very portable, and especially if all you need is a way to see yourself and frame up a shot for web video or something. also a good option if you need a cheap monitor for perhaps a crane or jib type device. With HDMI input. Can be used with HDMI-equipped video systems to monitor video (compatible with 24p).Useful for those with cameras without fully articulating screens or those needing more flexible viewing angles (on awkward shoulder rigs, jibs etc). pixel magnification and peaking facility which will ensure accurate focus confirming, give an enlarged pixel-perfect view of a selected portion of the Full HD image. Who it¡¯s for: Anyone who needs to view their LCD in a position not allowable by your camera¡¯s built-in LCD. Anyone who wants a larger video image for framing or focus assist.